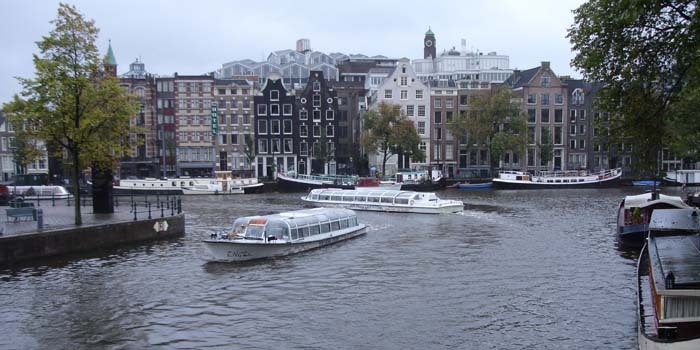 Cruise boats on the canals of Amsterdam. Amsterdam. It's called the "Venice of the North", and for good reason. I've never been to a city with so many canals and bridges, and a rich history of art and exploration as well. As usual, Hanne and I enjoyed our time on this trip, but with a few exceptions. As with most European cities, public transportation is excellent in Amsterdam. So, instead of paying 24€ per day for a parking garage downtown, we parked at the sports arena for 5.50€ per day, and received free Metro tickets to get us into the city. From the Amstel Metro station, we took a tram (streetcar) to a stop about two blocks from our hotel. After getting settled in the room, we went exploring. We made our way to the "Hard Rock Cafe" and had a couple of drinks, but were disappointed with the high prices. Next on our adventure was a 90 minute, evening boat cruise on the canals, which I recommend to everyone visiting Amsterdam. We saw all of the sights, and had an entertaining crew. A little game of chess. We got up early the next day, and walked through Vondel Park, which is probably the most famous park in the Netherlands. It's located very near the Museumplein, and offers a tranquil alternative to the hustle and bustle of city life. The Van Gogh museum was next after breakfast. Even though my favorite, "The Night Cafe", was not there, I was able to see "The Potato Eaters". We skipped the Rijks Museum, but made our way to the Flower Market. I'm not sure why, but Hanne and I envisioned fields of tulips and other flowers, so we were let down when we realized that we had reached the market, only to find shops which stocked mostly bulbs. For a step back in time of more than 400 years, you can't beat a visit to the Rembrandt Huis. The house has been nearly restored to the exactness of when Rembrandt himself resided there. Based upon sketches and notes left by the artist, as well as an inventory conducted by the bank which foreclosed on him, furniture and artwork have been precisely placed. As we coughed and gagged our way past one-too-many coffee shops that sold more marijuana than caffeine products, we reached the Anne Frank House. Unfortunately, the line was at least 100 people deep and wasn't moving, with only an hour left to closing time, so we didn't bother waiting. We also missed out on Madame Tussaud's Wax Museum, but I got a picture of the entrance anyway. This adds new meaning to the term, "Public Toilet".